All the civilizations that inhabited Anatolia; Hittites, Uratians, Phrygians, Lydians, Greeks, Romans, Selcuks and Ottomans created their own jewelry styles for religious and decorative purposes. Today, the Turkish jewelry industry reflects a rich cultural heritage combined with modern innovative designs and technology. 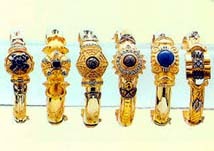 A great range of high quality gold and silver jewelry can be found in modern and ancient designs.